On my way to work the other day I noticed that Birchmount Stadium had a lot of people in the stands. Then I noticed the familiar white movie trucks. The extras didn’t seem to move very much. 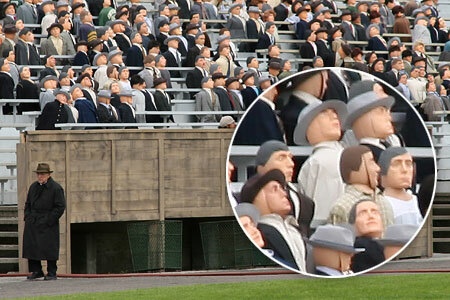 When I got closer I realized why—they were a bunch of dummies. ESPN is shooting a TV movie called Four Minutes (2006). It’s a story about Roger Bannister who broke the four minute mile on May 6, 1954. CBC has some great archival footage of the whole race here. I took some more photos from behind some trees while they were filming—security asked me not to shoot any pictures earlier so I had to be a little more discreet. 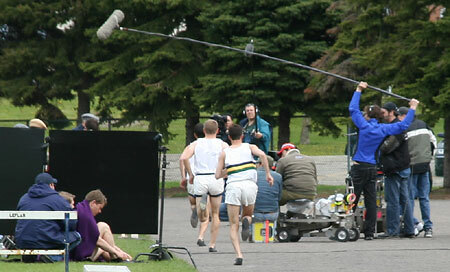 Below is a shot of some guys crossing the start-finish line.